(a) made of No. 1 grade or better spruce or fir. No. 1 grade or better spruce or fir scaffold planks are difficult to obtain. What else can be used? Historically, No. 1 grade planking specified in Regulation 91-191 was commercially available in New Brunswick. However, due to changes in grading rules, lumber is now typically graded as No. 2 grade and better. These changes followed a countrywide testing program that showed no significant differences in strength characteristics between No. 1 and No. 2 grades. The differences between grades relate primarily to the appearance of the material. Also, given that a number of Canadian timber species are grown, harvested, manufactured and marketed together, typical species combination for spruce and fir also includes pine. This species combination is stamped with the common designation S-P-F (spruce, pine, fir). Therefore, No. 2 grade and better S-P-F lumber can be considered as equivalent to No. 1 grade and better spruce or fir. It should be noted that No. 2 grade lumber is more susceptible to water infiltration and incipient decay. Incipient decay in scaffold planking is a concern because it is hard to detect and has a dramatic effect on the impact resistance of the plank. A weight loss of 2-3% due to incipient decay can reduce the impact resistance on planks by as much as 50%. It is therefore important that every employer ensures wood used in a work platform is of minimum risk to health and safety when used as directed. Employers shall ensure the proper selection, inspection and maintenance of wood scaffold planks. An important safety aspect that is often neglected on a formal basis is the inspection of scaffold planks. Planks often deteriorate quickly with use and age and are subject to damage. Don’t rely on others to inspect your scaffold planks or guarantee your safety and that of your co-workers. Insist that a trained individual from your firm does the inspection. At minimum, one should look for common defects as described and illustrated in the diagram on the next page. Checks: Lengthwise crack or separation occurring across annual rings. No such splits or cracks are permitted within three inches from the edge of the plank and planks with splits wider than 10 mm (3⁄8”) must be removed from service. Shakes: Lengthwise separations along the grain, the greater part of which occurs between the annual rings. 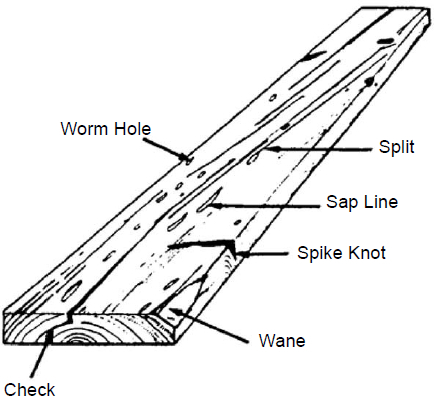 Wane: The bark or lack of wood from any cause on the face of a piece. Knots: Must be sound, tight, and well spaced. The maximum allowable size for the wide face of a 2” x 10” plank is 50 mm or 17⁄8”. For 2” x 12” planks the maximum is 60 mm or 23⁄8”. On the edges there should be no knots larger than 10 mm or 3⁄8” in the middle third of the plank. Planks with spike knots should be rejected. Planks can also be weakened by a condition known as dry rot. This condition is not easily recognized in its early stages, especially if the exterior of the planks has been weathered. However, planks that are substantially infected are usually lighter than sound planks of similar size and species. For this reason, planks that appear to be lighter than normal should not be used. (d) is laid flat with an overlap of 300 mm with another plank, with the centre of the overlap directly over a bearer. has a span not longer than 3 m.
be at least 500 mm (20”) wide. Platforms designed by an engineer that meet the criteria in paragraph 1 and planks designed by an engineer that meets the requirements of paragraph 2.